Nobody intends to cause an accident. However, if you’ve been injured because of another person’s carelessness, you might be entitled to compensation. Oceanside accident lawyer Zev Rubinstein is an experienced, dedicated advocate for the rights of injury victims. If you were hurt because of somebody else’s misconduct, please call The Rubinstein Law Group at 855-365-9955 today to set up your free consultation. 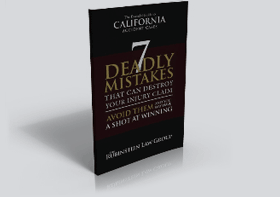 Our accident lawyer serves clients in or around Oceanside, California. “Accidents happen,” or so the saying goes, but that doesn’t mean the victim of another’s negligence should have to suffer in silence. Mr. Rubinstein has over 25 years of experience representing clients who have been injured in a variety of accidents. After receiving treatment, our Oceanside accident lawyer can begin gathering evidence to build a strong claim on your behalf. If a loved one passed away due to injuries sustained in an accident, Mr. Rubinstein can also initiate a wrongful death action on your family’s behalf. The death of someone you care about is never easy, but our Oceanside accident lawyer can pursue compensation to alleviate some of the financial burdens that might accompany the family member’s passing. To learn more about how our Oceanside accident lawyer can help you build a strong case against the party responsible for your injuries, please contact The Rubinstein Law Group or call 855-365-9955 today to schedule your free case evaluation.